Under the Radar magazine's Protest Auction starts tomorrow at 2 p.m. EST. 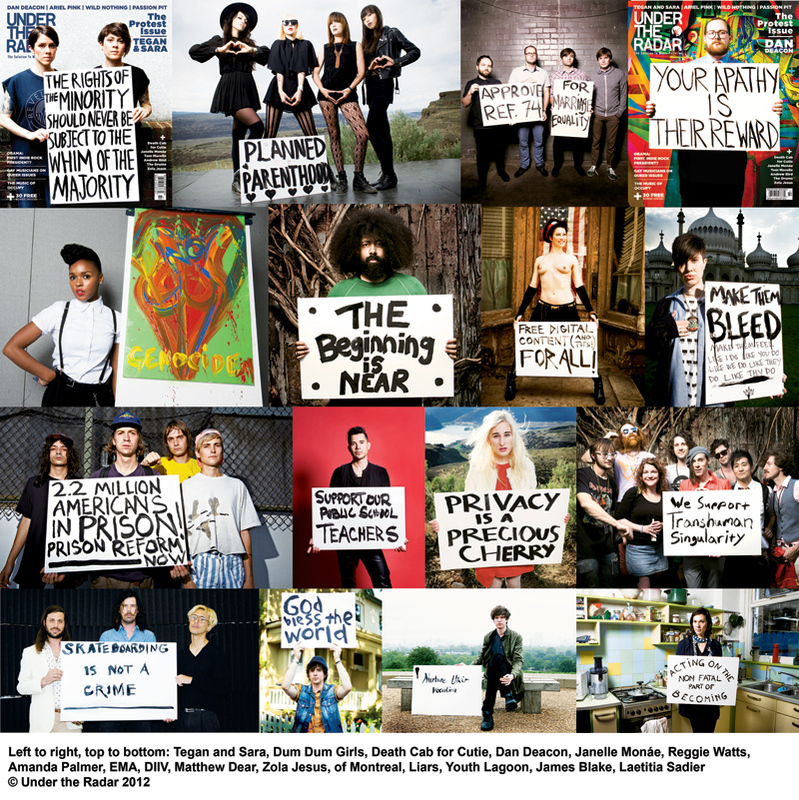 The auction features all of the autographed protest signs created by musicians for the magazine's The Protest Issue, which is on newsstands now. All profits will go to the War Child charity. For The Protest Issue artists were given boards and paint to make their own protest signs and were photographed holding them. The Protest Issue features two covers, one with Dan Deacon and another with Tegan and Sara. It includes major stories on the music of Occupy, musicians' involvement in the Obama campaign and the election, the difficulties of writing good protest songs, and gay musicians talking about current queer issues. The issue is still on newsstands and is also available to buy in the digital/iPad format—click here for details on that. Under the Radar also published Protest Issues in 2004 and 2008 and also auctioned off the protest signs for charity those years as well. War Child is dedicated to providing urgently needed humanitarian assistance to war-affected children around the world. War Child helps generate awareness, support, and advocacy for children's rights everywhere. More details on The Protest Issue can be found here. More details on the auction can be found here.